Finally we showed Joe’s video. We showed this towards the end of the presentation as we feel it collates all our ideas, especially drawing upon the religious theme. Having only seen the video on the day of the crit, it was difficult to talk about and incorporate into the remainder of the project however if we had more time, we would definitely have developed this religious theme further especially considering the criticism of a lack of theme/context. Overall, I feel the project was a success. We collaborated extremely well in an organised matter and produced a great deal of imagery; over 1000 photographs! I also learnt valuable knowledge which I will carry into future projects such as a deeper understanding of light but also features of my camera such as light balance which I hadn’t considered before. UPDATE: When printing the final 12 outcomes, something went wrong with the printer and the composition came out in black and white. This accident was actually a ‘happy’ mistake in my opinion. During the crit, comments mentioned how some of our images didn’t link too well and the overall selection seemed a bit disjointed. Having every image in black and white changes this perception and links the images more. Similarities such as cyclic shapes and patterns appear clearer in black and white too linking them further. In the last few stages of the project, I began exploring the layout of my A3 contact sheet. Initially I had planned to used a standardised format whereby all the images would appear the same size though this wasn’t possible due to the images orientations and difference in size; some people used a SLR camera and others a mobile phone meaning the dimensions differed somewhat. To overcome this, I explored a few variations. At the moment I am unsure which is my favourite and plan to gather a consensus from the group A3 spread; it would be nice for my individual one to link with that anyway. In terms of selection of ephemera, I wanted a broad range of explorations to reflect our experimental approach to the project. At first I selected those I found most intruiging from the 1132 photographs we had altogether. I then narrowed them down focussing on form, aesthetics, range of mediums, light source, colour and how recognisable that were in displaying the form of the object(s). I wanted a contrasting range of all these aspects so I attempted not to select two images that looked similar. My final 12 map the journey we took as a group from the beginning to the end of the project. It also represents our jumbled thoughts as, initially the images look totally random, however we looking more closely, it becomes clear the photographs do link in the same way our thoughts began to. With more time I think we could have selected our most successful approach and generated a selection of 12 images from them. This would remove any inconsistencies but also produce a continuous atmosphere in our images rather than images that initially seem unconnected until looking closer. ​Having had a short induction into studio lighting, I spent the final day of the project exploring my camera and its settings further. We sat through a short presentation discussing shutter speed, aperture and ISO all of which I have a fairly detailed knowledge on already. The presentation did mention white balance, something I am not too familiar with. Using this new knowledge that I need to change the white balance depending on the environment I am in, I began playing with the functions on my camera. I set up a basic situation involving the light bulb being lit with my phone torch. I photographed the same scenario changing the settings to tungsten, daylight, cloudy and other varieties. I learnt that this alters the colour to counteract the colouring of that particular setting however in the set up I had, it added warm and cold tones. Finally, I wanted to attempt to mask the light bulb in a way it becomes unrecognisable. In order to do this whilst also exploring white balance, I attempted a technique called a tilt shift whereby I removed the lens from my camera increasing the distance between the sensor and the lens. 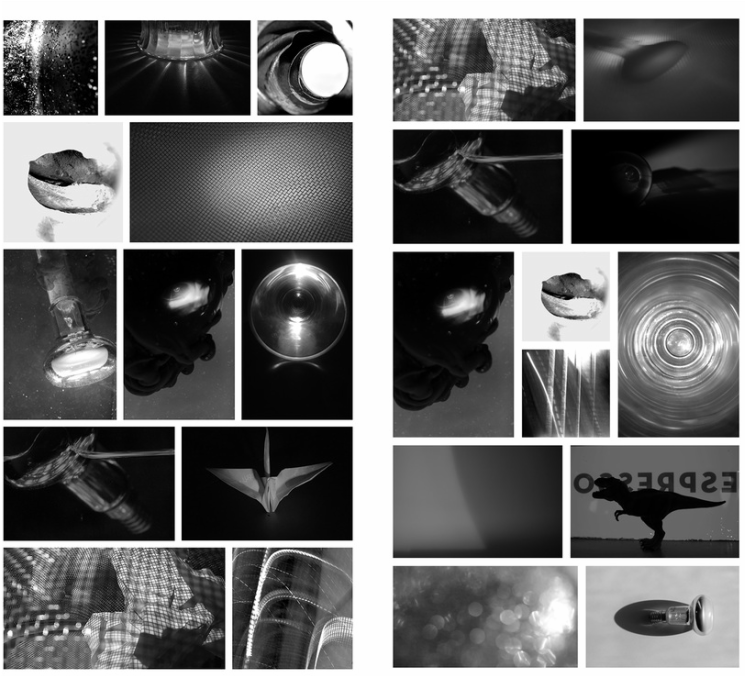 I explored photographing the light bulb with the lens the correct way around and the wrong way around. This caused light spots to appear and also blurred the object. Following on from the water and ink light experiments from last Tuesday, I began exploring a similar idea at home. I took a clear vase and placed four spotlights beneath it. I then explored the coloured ink and how light interacts with this and my lightbulb. I also briefly revisited the idea of UV and photographing the shadows on the page beneath however neither of these ideas were particularly successful. With the help of my brother we submerged the lightbulb in the water. This was extremely difficult as the lightbulb wanted to float so we attached a wound piece of acetate to force it down. I then took continuous shots of each scenario including coloured inks on various backgrounds including backgrounds of images we had previously taken. 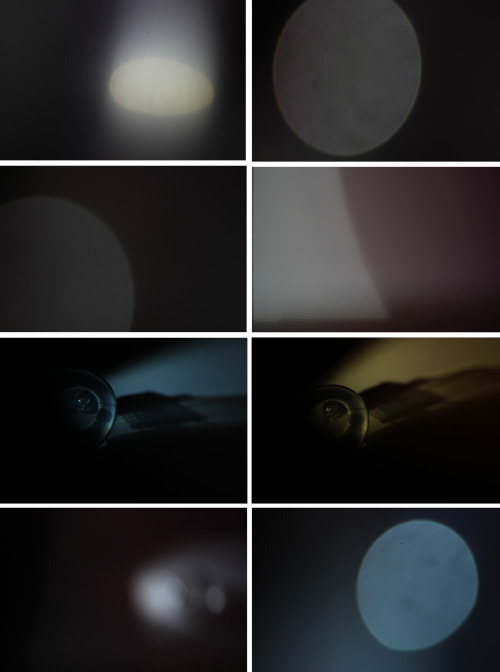 I also took images from different viewpoints including the top. These images seemed to replicate the effect of my previous images involving the use of the mirrors. Each image worked really well and developed upon the ideas of Tuesday. Hopefully we can explore this further in the remaining two days and compile a really successful and engaging 12 final images! The start of today was extremely stressful! Members of our group didn’t turn up so, as well as lacking ideas and organisation, the group seemed to fall apart. Initially we began exploring and experimenting with other ideas including glitter and honey but the majority of the group felt this was un-inventive as this idea was pitched at the beginning of the project as an idea a group had the year before. We therefore attempted to push this idea further and created a slow motion video where the glitter appeared like waves. We also tried a variety of other experiments using the shadows from the sieve and UV pens on our objects however, again, to no avail. After this we took an hours break and agreed to meet again later in the afternoon. At this point everyone was unmotivated and anxious as we agreed we needed some sort of theme to focus our ideas but appeared to all be conflicting in our approaches and objects. During lunch, Ella and I ventured to the campus shop to look at equipment which could draw upon the idea of water and waves. We purchased a sheet of acetate and two seal-able plastic wallets with the idea of filling them with water and using our hands/objects to interact. Ella and I presented the group with the plastic wallets and surprisingly everyone seemed keen. We began by simply photographing the reflection of the water onto white paper which was manipulated by the person holding the bag. We experimented with colour at this time by overlaying coloured acetate between the bag and it’s reflection to alter the colour on the white sheet. This was exciting though very hard to capture as the reflection was not sharp and therefore unfocusable through a lens. We had a slight issue with the current idea as it did not incorporate any of our objects. On a whim, I simply placed my lightbulb into the wallet and we began experimenting with laying the bag and moving the water around the object. We all agreed we liked the bubbled effect on the bag though it was difficult to get this consistent so we again revisited the honey which helped to recreate this bubbled effect. After a while, magic started to happen. When holding the bag and shining the UV light through it, the lightbulb itself appeared like a large bubble among the smaller ones. We played with colour by layering acetate below and behind the bag in opposing colours. We also dropped coloured ink into the bag which further highlighted the movement. At the end of the day we were far more relaxed and pleased about our work so far. We had a short discussion at the end of the day about how to proceed next week and all agreed to continue exploring this idea of colour and water. We suggested purchasing more bags and inks to explore the idea of multiple bags, perhaps having them hanging. We also have an induction in the photographic studio last thing on Tuesday so we must bare in mind ideas for this. All in all, a productive day in the end! 10 am saw the group meet again since having a whole week to mull over ideas and select objects and light sources. We presented each other with our objects and continued on to allocate a source of light for each individual to document; everyone would be photographing using the light sources but each member of the group would be responsible for recording the groups progress for each given source of light. We spent today purely experimenting. We methodically worked through each light source mentioned on the sheet however we soon realised these overlapped somewhat; for instance, shadows featured in many categories such as hard light and darkroom. Due to this we ran with ideas and photographed as much as we could. We also set up a group Flickr account. This would act as the meeting point for all the images allowing us to like our favourites to gather some indication as to which images we will use in our final 12. We could also comment on photographs with ideas etc. It became clear after a while how successful this Flickr account may be as we could easily compare each others’ images. This would hopefully aid us in selecting a theme or context for our images if we felt that necessary. Finally, as a group, we went for coffee. Around the corner from the university campus is a cute, little coffee shop which we selected as our ‘specific location’. We took photographs and drank coffee and discussed ideas. I feel today was a complete success. We uncovered a variety of ideas that we could focus over the coming days/week to inform our final outcome. Tomorrow we plan to continue, playing with the idea of UV and the remaining light sources before our photographic equipment induction next Tuesday. Today we were given another group brief whereby we were put in selected groups and had to fulfill strict requirements which included photographing an object(s) in a variety of light sources. We met in our groups and began discussing ideas which appeared to be fairly limited at the beginning; no one spoke up with specific ideas or inspirations. It appeared we were all struggling with how to approach this brief in a way that would create exciting and innovative results. We agreed to meet again next week with our objects, light sources and cameras and simply experiment with ideas hoping for a eureka moment to occur where we could select some sort of path to inform further ideas.